In sub-Saharan Africa, deforestation, water-intensive agriculture and now climate change are significantly altering water cycles and causing many rivers to begin to dry. A new study by UC Santa Barbara community ecologist Keenan Stears, with colleagues at UC Berkeley and Sokoine University of Agriculture in Tanzania, examines how these forces of global change are redefining the way hippos—and their dung—shape the ecology of freshwater ecosystems. The findings appear in the Proceedings of the National Academy of Sciences. "This work explores how hippo dung shapes freshwater chemistry and links these changes to associated patterns of aquatic biodiversity change," said Stears, a postdoctoral researcher in UCSB's Department of Ecology, Evolution, and Marine Biology (EEMB). 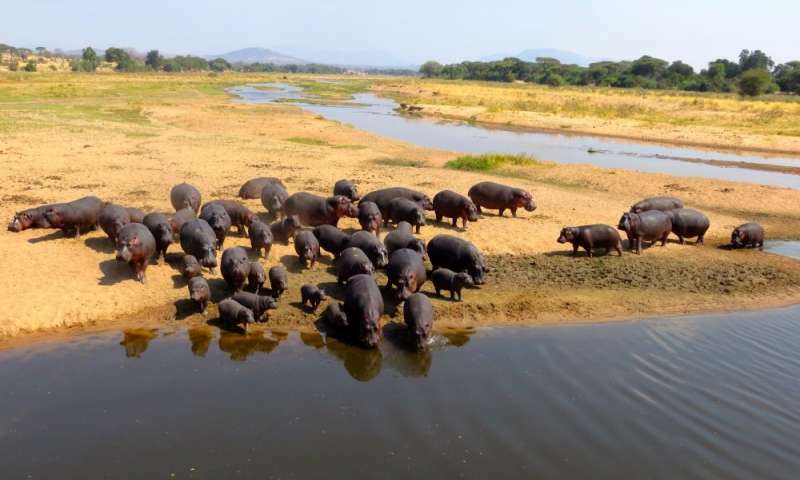 "It also illustrates that the net impact of hippos on river ecosystems is dynamically controlled by river hydrology and reveals the capacity of human disturbances on river flow to drastically alter the role of ecosystem-linking species." Stears and his team studied river flow and hippo density in the Great Ruaha River in Tanzania's Ruaha National Park, which protects an area about the size of Connecticut and is home to large populations of some of Africa's most iconic species. The Great Ruaha River is the backbone of life in this dry region. Since 1993, however, the once constantly flowing river has ceased to flow during the dry season. The researchers tested nearly a dozen attributes of water quality and measured the diversity and abundance of aquatic life in hippo pools over multiple years, both when river flow was high and during dry periods when the river stopped flowing. "During the dry season when there was no flow, the pools were completely separated," Stears explained. "We found a huge buildup of hippo dung, and therefore nutrient concentrations within high-density hippo pools. The high influx of nutrients caused the dissolved oxygen concentration to decline to sublethal levels for most fish species." EEMB assistant professor Douglas McCauley, a senior researcher on the project, called these results an alarm bell for African wildlife. "Hippos are to Africa what polar bears are to the Arctic," he said. "Everything we thought we knew about how African ecosystems worked appears to be changing. Global change has turned productive hippo pools, once teeming with fish and life, into fetid black cesspools." Only a few species of fish and insects are able to survive in the hippo pools when the river dries, because of extreme losses of dissolved oxygen in these pools. Stears and his colleagues noted large reductions in fish diversity and abundance inside the pools that were overfueled by dung when river flow ceased. When the rains returned and the river resumed its flow, the researchers saw a reset in many impacts of hippo dung on water quality and biodiversity detected during the dry season. "This suggests some kind of resilience within the system that allows it to recover after the hydrological disturbance every dry season," Stears said. "This resilience signifies that there is hope for this system, but without intervention soon, the chronic stress caused by river drying and overfertilizing of hippo dung may cause long-term species loss in this river system." "A lot of our results directly assess how changing river flow alters the hippos' influence on the ecological diversity and functioning of watersheds," Stears said. "However, these findings also call attention to the profound ways in which the dry-season impacts of hippos may influence local communities that rely on rivers as a food source. Tilapia are a commonly consumed fish throughout Africa and, during the dry season, we found that the presence of hippos reduced tilapia abundance by 41 percent across the watershed. That's not only bound to have ecological consequences but will also impact the human populations that rely on these rivers."